Following a strong tradition of affordable and light touring/commuter jackets, REV'IT! will be releasing the Horizon 2 Jacket for Spring 2017. The REV'IT! 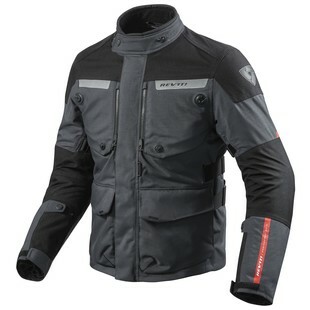 Horizon 2 Jacket has an outer shell that offers a combination of a few key REV'IT! features such as their Hydratex waterproofing technology, both 500D (PWR) and 1000D (Lorica) material, a thermal liner, and Fidlock magnetic fasteners for its large chest ventilation panels. This Horizon jacket will also provide REV'IT! 's updated tour fit, which is a bit more tailored than it has been in the past. Another big update to keep in mind lies in the CE protection that this jacket offers. The new REV'IT! Horizon 2 jacket provides their new SEEFLEX level 2 CE protection at the shoulders and elbows. It is also prepared for the CE level 2 SEESOFT back protector. For a light touring jacket such as the REV'IT! Horizon 2 Jacket, it certainly provides a number of great updates while still keeping the jacket at a much more affordable price.